Well, it is definite now. I will be having a two-man show with Cetin Oguz, an art professor at Delta State University, at the Meridian Museum of Art from January 3-31 2009 with an opening reception on January 3rd from 6-8 PM. I will have two gallery rooms to exhibit my surrealistic art. I plan on having between 60 and 70 framed drawings and mixed media images. My artwork should work well with that of Cetin's. His works are somewhat abstract mixed media representations of his beliefs, history, and ideas and perceptions of life. My art show at East Mississippi Community College in Scooba, MS went well. Lots of folks attended the reception, and I got a chance to talk to a bunch of them about my art. As result of this show, I am now going to be part of a three man show at the Meridian Museum of Art opening on January 3rd, 2009! I will be able to include even more pieces in this show than in the show at Scooba. The gallery features 3 large exhibition rooms on the first floor and one larger room on the second floor. The other two artists and myself will each have one of the rooms on the first floor to display our artwork. This is very exciting, as Meridian has a large group of people who support the arts. I will update this when I get more information. In other news, I was volunteered to be the assistant coach for the newly formed 7th - 9th grade cross country team at Starkville Academy. My son Joseph is in 7th grade and is on the team. We are an exceptionally young and inexperienced team, but the kids are making great headway and are getting in much better shape. They did exceptionally well at our last meet hosted by Pickens Academy in Alabama. Joseph won the junior varsity (junior high) boys division and our other junior high boy came in 2nd place. Our only junior high girl entry took 3rd place. We had four varsity girls in the top ten and their team came in 2nd place, and we had one varsity boy in the top ten. Joseph won 3rd place in a photo contest at the Noxubee National Wildlife Refuge for a photo of a buckey butterfly he took! He also won first place in an art show at the Prairie Arts Festival in West Point, MS earlier in September in the 7th - 9th grade division! I will be having an art show at East Mississippi Community College (EMCC) at Scooba, MS from 17 September through 8 October 2008 with an opening reception from 2-3 PM on 17 September. This show will feature a selection of my detailed surreal art, probably about 20 pieces in all. The show will be in room 25 of Aust Hall. The community college is about 50 miles south of Starkville on Hwy 45 Alt. At Scooba, MS, take the exit for Scooba/East Mississippi Community College at Hwy 16. Continue down Hwy 16 for just over a mile then take a right at the entrance to the campus under the large archway. Go straight through the campus until dead-ending in the parking lot for Aust Hall, the art department. Everyone is welcome to attend the opening and I look forward to seeing you there! A write up about the show can be found at the EMCC web site- MacGown Art Show at EMCC. ***July 13, 2008*** I will be having a one man show in the relatively new Eupora Fine Arts Center this coming spring (2009). 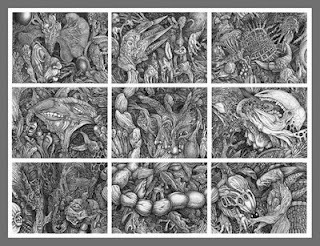 I am hoping to have at least 40 of my semi strange, very detailed, pen and ink, surreal works framed for this show. Dates are still tentative, but it should be in late March through mid April. I will post details concerning the exact dates and the opening date when I have that information. This gallery is an old downtown building, which is basically an elongate, rustic structure with brick and old wood. It is not a lot to look at, but it has two really long walls perfect for hanging lots of art! Hopefully, I can have a good turnout to the opening. I am getting great support for this show from Mark Wood, the owner of the Chalet, a local frame/art supply store here in Starkville, MS. Mark has been of great help in the framing/matting process, and I highly recommend anyone needing high quality framing or printing from this area to vist the "Chalet". This show is going to be of incredible quality (at least the frames) due to my works being framed and matted there. Addtionally, I recently received an artist's minigrant from the Mississippi Arts Commission and the National Endowment of the Arts to help pay for various expenses for the show. Last night I went to the closing reception for the People's choice Competition at the Meridian Museum of Art (here in Mississippi) where I had entered my drawing "Nine Panes of Thought." This contest is a bit unusual in that the viewers vote for their favorite works. This is a large show with entries from several southeastern states, all of which were of high quality. Needless to say, I was happy to learn that I won first place in the drawing/print category! The best of show went to a very nice oil paint portrait of an old man done by a local artist from Meridian. I was more than content considering I am not from Meridian and did not have any friends there who could vote for me. I also met some good contacts and it sounds like I may have lined up a couple of gallery showings for the future with at least two of them.